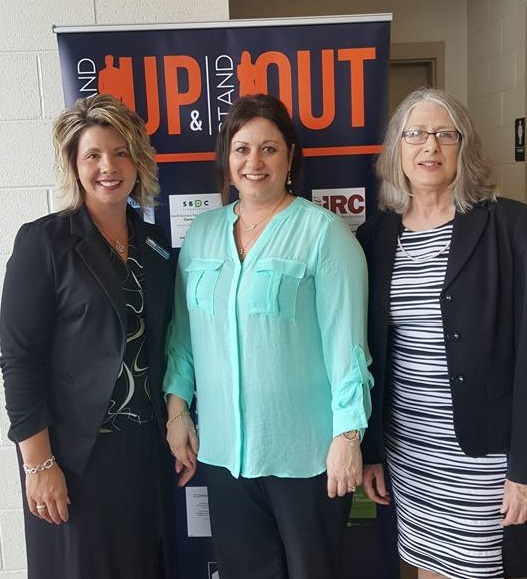 Jodi August, Executive Director; Tracy Stewart, Membership Coordinator; Susan Loskoski, Administrative Assistant (Provided Photo). DUBOIS– Things are looking up and moving forward for the Greater DuBois Area Chamber of Commerce, and 2018 has been one of the best years in the organization’s 73 year history. Director Jodi August said that the chamber is “stronger than ever,” noting that membership increased by 38 this year, bringing the total number of members to 450. She said the goal of the chamber has always been to have 500 members and they are a little closer to that goal. An innovative fundraiser that Penn State DuBois Business and Marketing students helped the chamber with was “DuBois-opoly.” The games, which are similar to the classic Monopoly game, sold extremely well and August said the fundraiser allowed the chamber to upgrade both the database and the website and, soon, the chamber will be debuting a smartphone app. There are still games available, August said, but once they are gone, no more will be made. The year has seen growth in the two biggest industries in DuBois, healthcare and manufacturing. August said that will their growth the area is seeing other businesses grow as well, entrepreneurs coming into the area and a population growth. In November the chamber begins to look forward to the coming year, and August said they have great plans for 2019. The year kicks off with the annual DACC Business Bash held Jan. 26 at the Lakeview Lodge. Only three awards are given out at this event, and she noted that with 450 members, winning an award is a very prestigious honor. Throughout the year the chamber helps businesses connect with each other through business connection luncheons, where a hot topic of the business world is discussed and a question and answer session held, and also the networking events held either as mid-day mixers or after hours events. August said that this year they are asking the host businesses to focus on an important event or milestone for the company, such as an anniversary, employee growth or other notable achievement. The chamber is also partnering with the Small Business Association, Small Business Development Center and Downtown DuBois Revitalization Corp. to host training events for online resources, such as social media. And in March they will partner with the Lions Club for the club’s annual “Night at the Races” event to be held March 23 at the Brady Township Community Center. And as they do every year, the chamber will hold their annual golf tournament the Friday before Memorial Day. But perhaps the biggest event for 2019 is the first Spirits and Street Eats Food Truck Festival. August said this was another event the Penn State Students came up with as a way to make DuBois a destination. She noted how other counties have destination events, such as the Ridgway Rendezvous chainsaw carving festival, and that DuBois has been looking for something unique to make their own. “We’re super excited,” she said, adding that the chamber is partnering with the Clearfield County Recreation and Tourism Authority to hold the festival, which will be Oct. 5 at Sandy Recreational Park. They are anticipating 30-33 vendors for this inaugural event, with 10 food trucks, three dessert trucks, eight wineries, eight breweries and three distilleries as well as some local entertainment. Letters of invitation will go out soon and registration is on a first come, first served basis. Tickets for the event will go on sale in early summer and are limited to ages 21 and over. No sooner will the chamber conclude the Food Truck Festival than they will gear up to host the Pennsylvania Association of Chamber Professionals conference. August said the chambers submit bids to host the event each year and this year DuBois was awarded the honor. The event will take place at the DuBois Country Club Oct. 16-18 and will be a prime opportunity to show off the area to the 80-100 chamber professionals, representing 44 different chambers, that attend each year. And already DACC is looking forward to 2020, which will be a banner year for the chamber as it celebrates it’s 75th anniversary. August said they are looking for ways to make the year a memorable one. 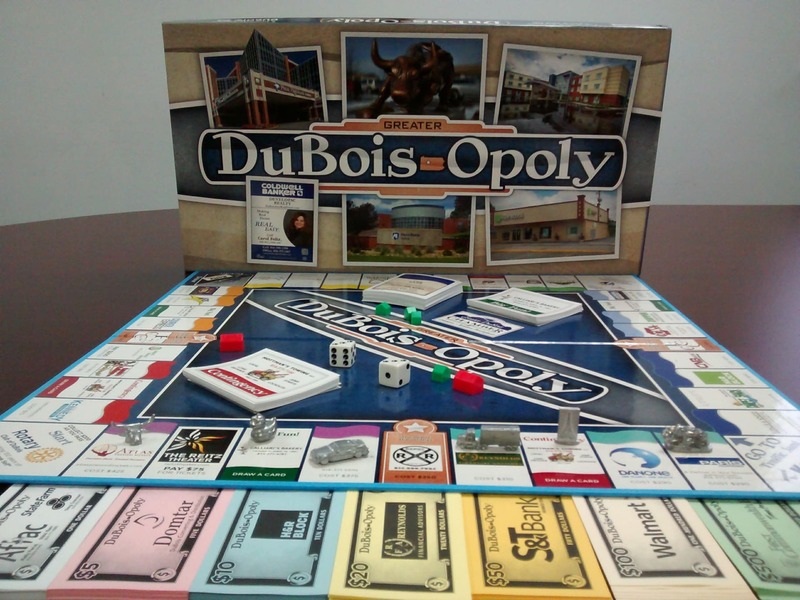 Greater DuBois-opoly board game (Provided Photo).